PETROFER CHEMIE is a German company having over 70-year history and experience, which is producing industrial oils by reflecting the latest technologies. Centered in Germany, it is also located in many other countries that produce and distribute. Parallel to the rapid development of our industry in the last 20 years, the demand to PETROFER products in our country had a very big increase. To supply this demand, in 1983 as a representative and distributor, and then in June 1995, PETROFER ENDÜSTRİYEL YAĞLAR SANAYİ VE TİCARET A.Ş. 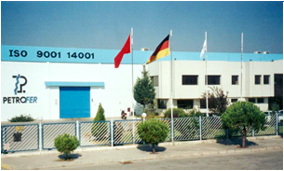 was established as a Turkish – German associative investment located here in Çigli – Izmir / TURKEY.